Sofitel Guiyang Hunter is the first French luxury hotel in Guiyang. It is situated in the city centre, adjacent to Hunter shopping mall. It is only 11 km away from Guiyang Longdongbao International Airport and 3.8 km from Guiyang Railway Station. This luxury hotel features 274 spacious rooms and suites, which come with floor-to-ceiling windows to best capture the magnificent views of Guiyang. The hotel also features So Spa, LE CHINOIS, KWEE ZEEN and LE BAR. 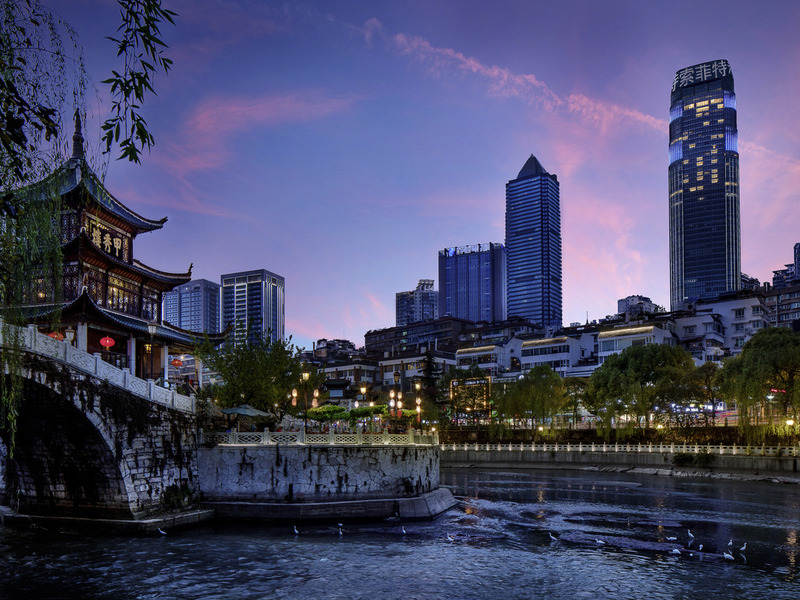 Guiyang is the capital of Guizhou, a province of Southwest China. Sofitel Guiyang has 274 spacious rooms and suites and features So Spa, LE CHINOIS, KWEE ZEEN and LE BAR. Although I don't have much luxury hotel experience, personally, I think Sofitel Guiyang can be comparable to the Ritz-Carlton in Hong Kong and slightly superior to Four Seasons in Macao. The hotel is located in the downtown area and downstairs is Hunter shopping mall, pretty convenient. The transportation is very convenient as well. The room facilities are good and the room is warm. The room service is also awesome. I would like to pay special tribute to the hospitality of Sammi and Daphne. The experience was really good with the fabulous service standard and every effort made to meet my request . I spend several days of vacation in Guiyang. This hotel definitely is the best one during my stay. To be mentioned is that Shauna was very nice and patient to guide me go thru several hotel rooms and introduce the differences in detail. Sammi was also kind to offer me the free upgrade to enjoy the afternoon tea in the executive floor. And I was treated friendly by so many people which I cannot remember their names. Overall it was a nice stay except I feel the price was a little higher than I expected. Very charming welcome by the hotel team from the begining, pay a lot of attention. The personal such as Flora in reception and the girls in Loung are so nice, professional and humain. Can't see greeting smiles on the check-in desk staff. The concierge desk downstairs seems short of labour and the staff there are too green. However, the female staff in the passenger lift lobby on 55/F are enthusiastic with courteous manners. a fantastic stay in Sofitel Guiyang Hunter and thank for the extraordinary upgrade to the prestige suite. With an excellent location and in the iconic property, Sofitel Hunter is no doubt a first choice for trips of biz and leisure. The floor to ceiling windows captures the excellent city views. Lobby and Le bar on 55th floor are also this hotel feature. Friendly and well trained staff let u FEEL WELCOME and definitely will come back soon. The stay was wonderful: the room clean, the location was excellent, the service and breakfasts were great. City location, very welcoming reception. We were collected at the train station by a driver and English speaking manager from the hotel which was a really nice touch. Although only a 1 night stay with our teenage son we had a really nice day experience. The hotel restaurant was about to close as we arrived late, and they accommodated us by staying open which we were very thankful for after a long train journey. Later we retired to the function room which had been turned into a screening room for the World Cup! Attentive bar staff and easy check out the next day. Very nice property. Great staff and excellent room. Food in the restaurant showed great variety, quality and taste. All in all, the hotel was a great value and an excellent stay. Most hardware / facilities in the hotel is in good condition. However service was a disappointment. Below are some comments: 1. Front desk staff was nice and efficient upon check in. 2. Gym was small but equipment was well maintained. However for the two times I went it felt like there is no air conditioning and there was a very strong scent that attacks the nose (smelt like renovation more than a pleasant scent). 3. Very nice environment at the executive lounge, however it is one of the worse food service I have seen at a lounge. There is VERY little food available and the hot food is kept inside the kitchen unlike other hotel served as a buffet style. Food quality was not satisfactory as well. 4. My major complaint will be about room service. I tried to order room service at around 7pm dinner time, wanted some bread to go along with the soup. The operator on the phone told me &quot;sorry we do not have any bread at this time of day&quot;. I was shocked that a 4-5 star international brand hotel do not have ANY bread in stock (particularly when there is a buffet going on at night). I even told the operator that I know it is not on the menu but I can pay for it. The operator went on and asked the kitchen and called back still saying there is no bread and also executive lounge only have baguette. I finally gave up and ordered another appetizer instead and asked to speak to the manager on duty. After few minutes the manager called back and immediately offered bread, and asked what kind I wanted. I ended up with smoked salmon (because kitchen made it already) with soft rolls and butter. This incident clearly indicated that the front line staff does not think outside the box or try to problem solve when a request is &quot;not by the book&quot;, &quot;not on the menu&quot;. I was quite disappointed on the service. The hotel is newly open and located in a good area that is closed to all the attractions. The room was well appointed, very spacious and luxurious. The staffs were cheerful and helpful. They speak good English. Special thanks to Josh for making our stay the most welcomed. Unlike most Chinese hotels, my check out experience I have with Sofitel Guiyang was fast, expedient and smooth. All and all, a wonderful stay! People in Sofitel are very nice and polite, very helpful.